The summer sun is shining and the outdoors are calling your name! An ideal way to celebrate the warm weather is to have a memorable meal in your Signature outdoor space. Get ready, fire up the grill and start taking notes, we’re about to share a few of our favorite appetizers, entrees and sides for summer al fresco dining. Grilled Corn Salsa: With tangy lime and fresh cilantro, this grilled corn salsa couldn’t be more perfect for summer. Strawberry Balsamic Bruschetta: This is a super quick yet impressive recipe to throw together and will make your friends fall in love with you (and balsamic glaze). Watermelon Caprese: This sweet twist on a Caprese salad was made for summer. Drizzled with a balsamic glaze, this recipe is sure to be a hit! Grilled Vegetable Platter: The best of summer in one dish! These pretty grilled vegetables are meant for entertaining as the grill brings out their natural sweetness. Corn and Poblano Chile Salad: A super easy grilled corn salad with poblano chile for an extra kick. 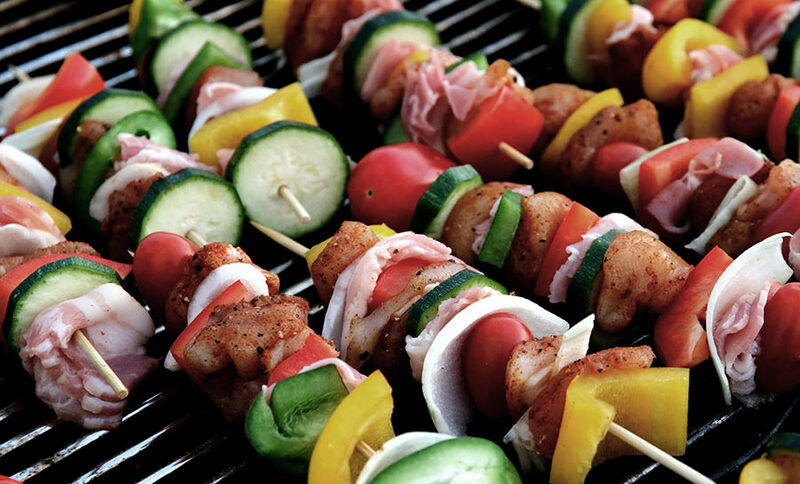 Teriyaki Shish Kabobs: These savory sweet kabobs are unbelievably easy to make and they’re so perfect for a summer cookout. Gochujang-Marinated Skirt Steak: Skirt steak is the ultimate summer steak for grilling—quick cooking, buttery, and versatile. Blackened Salmon with Corn, Tomato, and Avocado Salad. The smoky char from this blackened salmon recipe is one seriously addictive game-changer. Classic Burgers. Take your pick of these 15 grilled burger recipes (including a few meat-free options for your vegetarian friends). Barbecue Chicken. This juicy chicken has all of the sticky-sweet flavors of the sauce. Now that your ultimate al fresco menu is planned, add in your favorite neighbors, summery sips and a few backyard games to complete your evening. Cheers to the summer season in your Signature home! Be sure to follow Signature Homes on Facebook, Instagram, Twitter, Pinterest, and visit our Houzz page as we share news and updates about our exciting new home communities as well as helpful homeowner tips.